Measuring Guide For Amber Teething Necklaces. Learn from Experts. At Amber Artisans some of the most common questions we get each day are regarding sizing and measurements of our Amber Teething Necklaces and our Amber Necklaces for Adults. The length is a personal preference. Most importantly, you want to be sure that the necklace fits comfortable and close but not too snug. The necklace should be at least 2 inches (5 cm.) longer than the diameter of the neck. It should not fit like a choker. Some choose a length that adds more than 2 inches to give more growing room, and others choose to add no more than 2 inches so there is less room for their child to fool with the Amber Necklace or bring it to their mouth. Important!!! Amber Teething Necklaces and Bracelets are made to wear but not to chew! 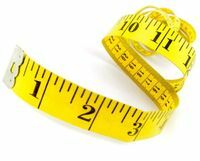 The easiest way to make your determination is to take a tape measure or even a piece of ribbon or string and loop it carefully around your child's neck to see what length fits most comfortably. Also, it is not unusual for Amber Necklace to stretch a bit in length over time. Most customers find that the 12-13 inches (31-33 cm) length is perfect. While they may be slightly long at first, they find their child can grow into it as they get older. Many teens can still wear these Amber Necklaces as choker style necklaces! If you prefer a longer necklace for your teen, we would be happy to make it to your specifications. If you have a special design in mind, we are glad to accommodate you! We recommend the Amber Necklace be worn even after teething is finished as the many other benefits of Amber's therapeutic properties will continue. Amber has immune boosting properties and helps with many other ailments including eczema, growing pains and even arthritis. Learn about the many healing benefits of Baltic Amber. What do I need to know about the care of the Necklace? Please remove the Amber Necklace before swimming or bathing. Whilst the necklace will cope with getting wet, we have experienced that the chlorine and other chemicals used in swimming and spa pools and the detergents in bath soaps and shampoos are having a detrimental effect on the silk threading. Once the necklace is wet it is essential that the necklace be removed and completely dried before it is re-worn. Learn more about safety of Amber Teething Necklaces.